Margaret Smock married Allen John Houghton, son of Alvin Hale Houghton and Martha L. Houghton. Elaine Houghton married (?) Boule. (?) 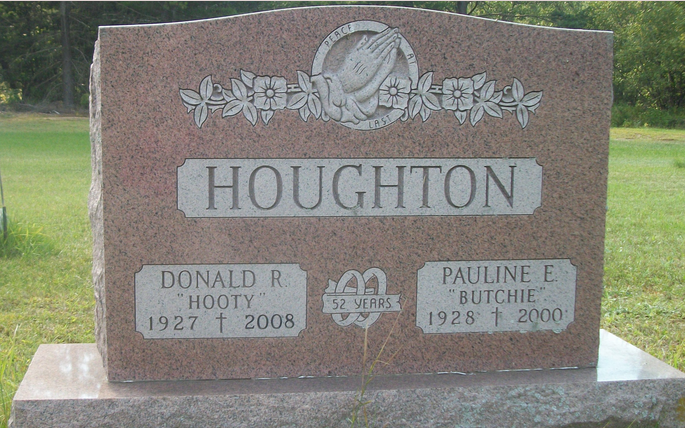 Boule married Elaine Houghton, daughter of Rodney S. Houghton and Frances E. Doore. Joe Houghton married Charlotte Kelly in 1974. Charlotte Kelly married Joe Houghton in 1974. Pauline E. Archibee married Donald R. Houghton, son of Oscar Rolland Houghton and Ella Pearl Roeder, in Jan 11, 1948 at First Baptist Church, Carthage, Jefferson Co., NY, USA. Julie Houghton married George Shafer. George Shafer married Julie Houghton, daughter of Donald R. Houghton and Pauline E. Archibee. Sandra L. (?) married Henry Arthur Houghton, son of James David Houghton and Ruth V. (?). Talena Houghton married (?) Skaggs. (?) Skaggs married Talena Houghton, daughter of Henry Arthur Houghton and Sandra L. (?). Francis D. Houghton married Elizajane C.K. Kemmerer. Elizajane C.K. Kemmerer married Francis D. Houghton. Robert Houghton married Frances Woodard. Emile Joseph Grondin married Leana Houghton, daughter of William Houghton and Ann Turner. (?) Demers married Elizabeth Houghton, daughter of William Houghton and Ann Turner. Emile William Grondin married Ruth Molinski. Ruth Molinski married Emile William Grondin, son of Emile Joseph Grondin and Leana Houghton. (?) DeVaney married Ruth Evelyn Goodwyn. Tara P. Houghton married Jason Heinzig. Jason Heinzig married Tara P. Houghton, daughter of Charles Raymond Houghton and Barbara Jane Kendra.